Intel has officially revealed a new M.2 version of their 905P SSD, shrinking their high-performance Optane storage into a smaller form factor than ever before. So far, Intel's Optane M.2 storage has been limited to Optane Cache acceleration drives and small (118GB Max) SSDs, all of which were limited to PCIe 3.0 x2 speeds. Intel's new M.2 905P is set to change that, offering high-end Optane performance with PCIe 3.0 4x bandwidth access and what is estimated to be 380GB of storage capacity per drive. This 380GB estimate comes from Intel's live demo, which used a RAID setup of four of these drives to offer approximately 1.5TB of storage. The M.2 form factor will allow Optane drives to be usable in mobile systems and across a wider range of consumer desktops. Previously, Intel's 905P was available as either a PCIe add-in card or as a 2.5-inch U.2 storage drive, neither of which are commonly used for desktop storage. 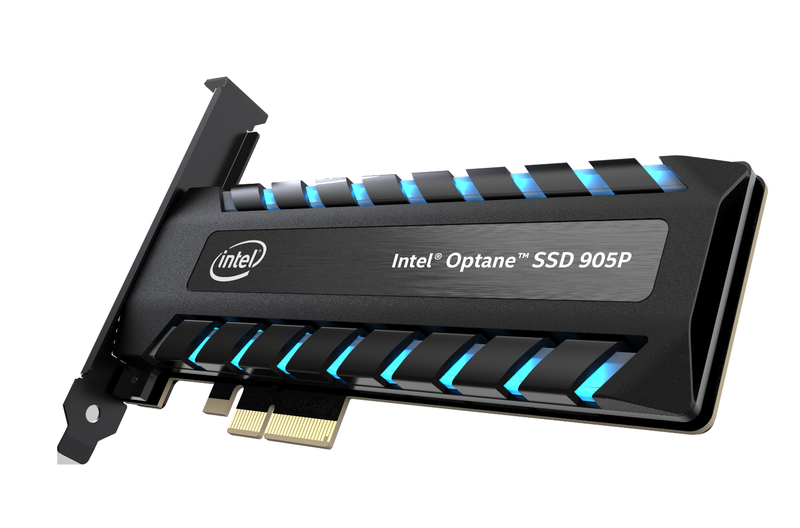 Below are the specifications of Intel's existing 905P series of Optane SSDs. Intel has not released the final specs of their new 905P M.2 SSD. Intel says to expect their new M.2 905P SSD to release this summer. You can join the discussion on Intel's new M.2 version of their 905P Optane SSD on the OC3D Forums.